I loved sending birth announcements out with the kids were born. And I love when I get a cool looking invitation to a party. It makes me want ice cream. I thought the nightclub flyers were really catchy and was amazed by all the nightclub templates they had. Mind you, it’s been ages since I’ve been to a nightclub but if I got an invitation like the ones above, I’d be curious to check it out. And great news. 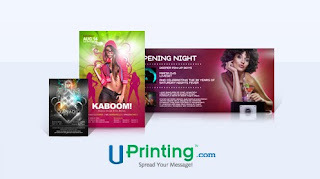 Uprinting.com is giving away 250 flyers to a lucky reader. They come in thick 14 pt. 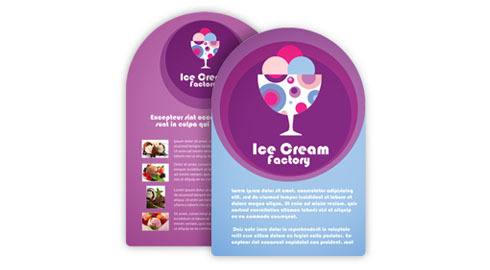 glossy card stock and you can choose between two sizes: 4.25”x 5.5” or 4” x 6.” There are so many ideas for the flyers….have an address change? A birth announcement? A birthday party? Want to announce your blog? The possibilities are endless! --If your e-mail address isn’t linked to your blog, please leave it in your comment so I can contact you if you win. Mandatory Entry: Please let me know if you won the flyers, what kind would you create? Contest will run for a week. I will announce the winner Wednesday, July 27th. I love the oval die cuts. I would use them for my daughter's projects at the animal shelter. Oooh! Roxy has a birthday coming up. These would be perfect! These look awesome! Thank you for running the giveaway! I'm trying to get the word out that I am available to tutor physics/science here (I had such a great network in New York, then I moved!) These would be great to provide to local high schools for students who are struggling! Depending on when they arrived I would use these for moving announcements (we moved this week) or baby announcements (due late October). Even if I'm not the lucky winner I'll go check out the site as a contender when I order mine. Awesome giveaway! I have so many things I could use the printing for! I'm recently engaged and these would be really nifty for my Save The Date's. We also recently moved, or I would enjoy making a photography flyer for pictures I have taken. I'd use the die cuts for announcements. If I won I would use then for my roller derby team flyers. We do a lot of charity work and we make flyers for all of them so it costs a lot. I love getting "real" things in the mail. Those are great! These are SO cool!! I would use them to promote that I am an Herbalfe Independent Distributor! Sign me up for some flyers! If I win them, I'll likely shill poker games and/or my poker blog. Those are so pretty! We would love to enter the giveaway, as those look so versatile. Thank you! magicnumber3@gmail.com. I like that ice cream design! So pretty! These are so cute. I would love them to do birthday invites for my nieces. I am heading to the police academy and will (hopefully) graduate in November. So, I'd love to have some snazzy invites to my graduation party! Cute stuff! :D I'd even recycle them and use them as bookmarks after the party.